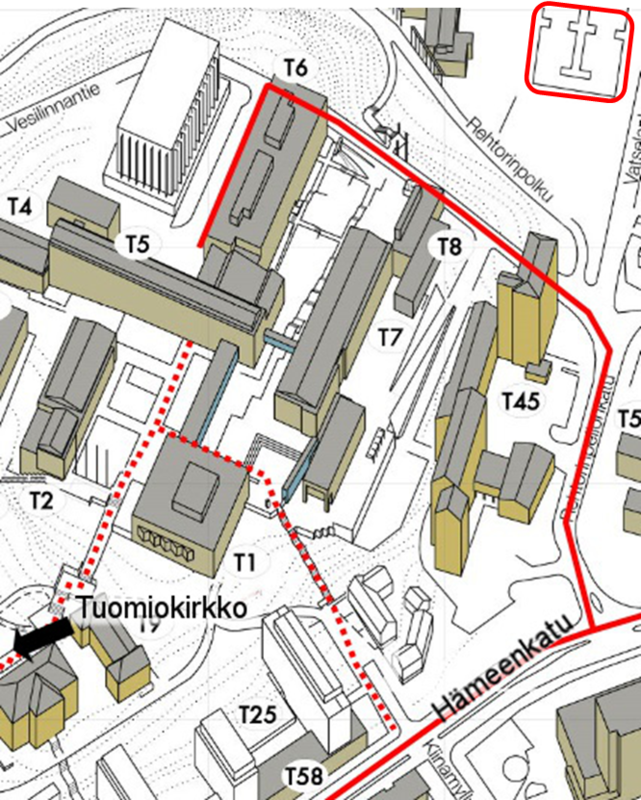 Finncon 2018 takes place in three distinct but interconnected buildings on University Hill in Turku: Natura (former Natural Science Building 1, labelled as T5 in the smaller map below), Agora (former Natural Science Building 2, labelled T6) and Quantum (labelled T7). To gain the best understanding of the venue, it’s a good idea to come in through the main doors, located in the Natura building. The info desk of the con is also located there. 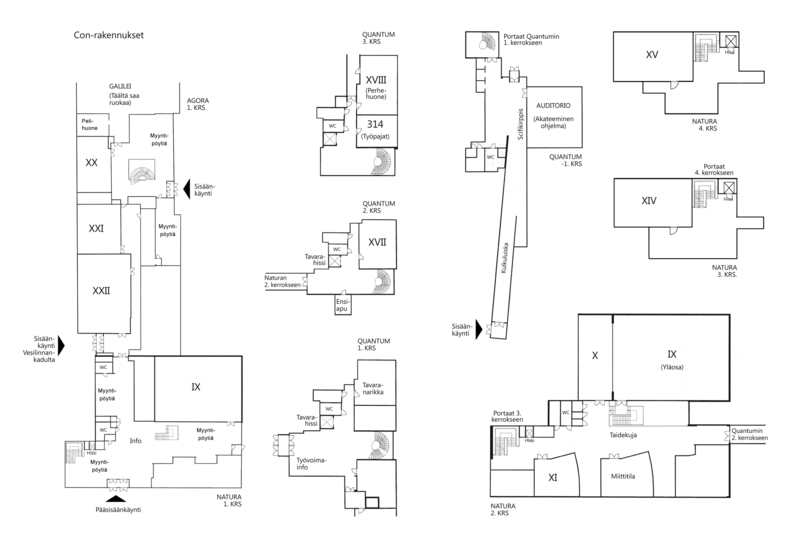 It’s recommended that the volunteers use the first floor doors of the Quantum building, located right next to Natura. The accessible entrance is behind the Agora building on Vesilinnankatu. During the event we ask the public to also use the doors on Quantum’s floor -1 as well as the side doors in Agora, so that bottlenecks especially between Natura and Agora can be avoided. When approaching the venue on foot from the direction of Hämeenkatu, the simplest route to the venue is up the hill using the stairs located on that side of the University Hill. When coming from the direction of the Turku Cathedral, you can take the stairs through the Koskenniemi park to get to the venue. Each of these routes is indicated on the enclosed map as a dashed line. When travelling by car, use the following route: Hämeenkatu-Rehtorinpellonkatu-Vesilinnankatu (indicated as a solid line on the enclosed map). Due to the ongoing demolition project at the University Hill, this is the only route to the con venue by car. This is also an accessible route to the University Hill. The parking places of University of Turku around the University Hill are available to the con guests throughout the event. The university parking places are shown on the enclosed map. We recommend that visitors use the larger parking areas along and at the end of Vatselankatu (indicated with an outline on the map below). NB! The parking place next to Juslenia shown on the map is unavailable due to demolition. Due to the demolition project, it’s may be that driving through Henrikinkatu is not possible during the event. There are places available for accessible parking on the University Hill (more information about this is available in the accessibility section). University Hill lies within easy reach of public transport. From the city centre, you can take a bus to Hämeenkatu, a road that runs right past the university, and the walk from the Kupittaa Railway Station to the university takes approximately 10 minutes. Some of the Onnibus routes departing from Helsinki stop at the University of Turku stop on Hämeenkatu, and the final destination (Turku bus station) is not far away. Various bus routes run from the Market Square to the University’s bus stop. These include for example routes 2, 50, 51, 53, 54, 55 ja 56, and you can find their timetables and fares online. The buses of the public transport service provider Föli are easily recognisable from their bright yellow colour. You can find more information about the routes on reittiopas.foli.fi, and it’s possible to check the bus stop-specific times for a route also on mobile app Stoppi. You can also check out the new Turku city bikes. The closest city bike station is at the junction of Hämeenkatu and Rehtorinpellonkatu.